If you want to add a gorgeous modern look to any windows in your home in a matter of minutes, we’ve got just the thing. Bofeifs Frosted Window Sticker Film comes in a roll that’s 17.7 inches wide by 78.7 inches long. It can stick to any windows in your house, apartment, or office using nothing but static, so you don’t have to worry about annoying adhesives that might ruin your moldings. And the best part? It’s only $5.79 a roll if you use the coupon code J8PDN6OZ at checkout! The possibilities are only as limited as your creativity, and you can see some design examples on the Amazon page to get an idea of what you’ll be able to do with this cool film. 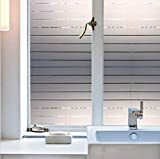 WIDELY GLASS FILM Decorative blinds film can be applied in all SMOOTH GLASS surfaces such as home, balcony, glass door,bathroom,bedroom,dining room,office meeting room,and other DIY glass surfaces. PROTECT YOUR FURNITURE from FADING The no glue window film blocks 99%UV,protecting home furniture,carpet, curtain and wallpaper from strong UV and sunlight. STRONG ADHESIVES Window Sticker film is self adhesive without glue needed, has an static cling feature that allows to be removed and reused without leaving any residues left; saving you time and hels to decor your home in minutes. EASY APPLICATION The decorative window cling is easy to install with water and a soapy cloth, just follow the instructions in the package or the tips below. Please feel free to email the seller if you have any problem.